Rambling Ronni: Why Are So Many People Depressed Nowadays? We will all die someday. This is a pretty sad realization of life. Most of the time people die due to no cause of their own. In fact, that’s how it’s supposed to be. But the past week there have been two notable instances of well-known and well-loved individuals leaving the world of their own accord. This is not a blog post that reminds you to reach out to someone else when you need help. I hope you already know that. I’ve written entire blog posts about the importance of getting the help you need, in marriage, in motherhood, and by extension all other aspects of life as well. This is a blog post to say: I don’t know the answers. But I’m searching too. The other day, after learning the news of Anthony Bourdain’s passing, I googled “Why are so many people depressed now?” as though google held some kind of mystical answer to all things. This was the second article that came up, and the first I clicked on. Though it seems to be a bit of a lead into the author’s book about the millennial generation, still, I took note of the possible answers offered in it with interest. The article didn’t blame the usual technology, environmental factors, or political climates. Instead it offered three simpler, and seemingly more plausible, ideas. 1. Our relationships and community ties are weaker. Relationships. I’ve been blogging about marriage since I started this blog 4 years ago, and ever since then I’ve been quietly asking myself: Why do I care about marriage? Why do I feel compelled to encourage others to stick it out during the tough times? Why do I think marriage is a worthwhile relationship to maintain? And I think this is what it comes down to. I care about marriage because I sense that there is something about marriage that is elemental to our humanity. It’s more than just romantic love, more than just a means for procreation, more than just the comfort of committed companionship (although yes, those things are great too) — marriage is, in a sense, the ultimate “micro”-relationship by which we relate to and engage with the “macro”-relationships we have with the rest of our society. The interpersonal skills necessarily to maintain a marriage relationship are valuable skills for all members of a society to have, regardless whether an individual chooses to marry or not, and I believe that a society that actively encourages successful marriage relationships is a stronger society. I think that’s why I blog about marriage. NOT because I think everyone should get married, or because I think every marriage should be perfect, or even that I think that every marriage can be saved (I don’t). But because I believe that, overall, that marriage plays a beneficial role in society. Community Ties. Funny story. Several weeks ago, I was at a preschool birthday party with my son. I found myself chatting with a dad of another boy in the class. Turns out, he’d gone to grad school at the small Christian college I got my undergrad. The conversation was comfortable and we continued talking. He said he worked at a local church (but didn’t specify what he did there), I talked about my dissatisfaction with the modern “megachurch” movement. He mentioned trying to figure out the direction for his own church. I asked point-blank what he thought the point of going to church in the first place was? He talked about the importance of community and how he felt that one of the biggest draws of church membership was being part of a strong community of others with shared beliefs. Aaaaaactuallllyyy……wait. I’m being overly kind to my role in the conversation. Because honesty? I’m pretty sure I was talking waaay too much. Because WHO asks a random dad-of-a-kid-in-your-kids-preschool-class what’s the whole the point of going to church in the first place? Esppeciallllllly when you then find out that said dad is….wait…for…it…. The PASTOR of his church. Yes guys, I did this. I’m sure I was way out of line. Sigh. Point being – community. I think the pastor was right about this. We’ve swapped out in-person relationships for online acquaintances. I’m absolutely guilty of this. And it’s something I’ve been heavily working on recently. Though my personal beliefs have changed since I was a youth, I do very much miss being part of a church community. I’ve read about the recent rise of “atheist/agnostic churches” and I totally get why. We may not always be sure of what we believe, but I’m pretty sure that we all want to belong somewhere. 2. We’re more focused on goals such as money, fame, and image. A year and a half ago, I randomly attended this local conference thing (that I’ll get into later because I have at least 2 other posts that I still want to write that were inspired from this same event) and sat in on a session with a motivational speaker. I’m not really into the whole motivational speaker thing, and hadn’t realized that’s what the session was until it was too late to leave. The audience was small and I was near the front of the room. So I sat through it. The speaker told of his own story in ‘following his passion’ and how he became a public speaker, and outlined specific steps that the audience should take to find their own success in life. And how if you believe it you can achieve all your lofty goals. Yada yada. Yeehaw empowering and inspiring, right? I’m pretty sure I caught the speaker in a question he didn’t have a ready answer for. He answered something about how yes, there are times where he counsels clients in accepting disappointments and finding contentment in their lives…but that’s only after multiple setbacks have led them to that place. But I don’t think he understood what I was asking. He never took off his “motivational speaker” persona. He never seemed real. I wanted a real answer. I think our society needs a real answer too. We need to know, from the very beginning – not just after enough “failures” and we feel like we have no where else to turn – that our value and worth is not only measured in the achievement of specific goals. Heck, *I* need to remind myself of this. Sometimes almost daily. Here in “Hollywood” there’s always this idea – just gotta get into the union, sell a script, book a series, earn a nomination, get a star on the Walk of Fame, etc, etc – there’s a continual chain of goals that one must always seek to obtain. Even in the online ‘blogging world’, there’s this continual pressure. Just gotta reach 10K views, get enough instagram followers to be considered an “influencer”, get an ebook on Amazon, launch a speaking tour, etc, etc. I’m not saying there’s anything wrong with having these goals, because heaven knows I’m chasing all these things too. And I enjoy chasing all these things and am not likely to stop anytime soon.. But maybe along with these goals we should ALSO be stressing how to be content with where we are currently. How to be thankful for we do have, in this moment. Learning how to do what we can with what we have — isn’t that all we ever can do? 3. Our expectations are too high, possibly because of the emphasis on “You can be anything you want to be”. I admit that I’ve always struggled with this concept, especially more so now as a parent. I know that I’m supposed to instill this idea in my children — inspire them that with hard work, nothing is off limits for them. But. Hopefully I’ll find a way to balance that exuberant idealism with realistic expectations and set them up for actual success in the real world. Because truthfully – and gah! I know that no one wants to hear this – not everyone can really be whatever they want to be. Sure, there’s always those rags-to-riches stories, and I’m a firm believer in always having hope…but there’s something to be said about being realistic about where you are, what you have, and what you can do with what you’ve got. I think we all have a great capacity to do great things. But we also can’t ALL be The President, NBA basketball players, multi-million dollar movie stars, Instagram “influencers” with 100K+ followers, jet pilots, or world-renowned fashion designers. And this is ok too. I recently read a (veeeery long but) extremely fascinating article in The Atlantic called “The 9.9% Is the New American Aristocracy“. I don’t think KP and I are quite in that 9.9% (yet? ), but I won’t lie – it’s certainly where we aspire to be one day. I liked the article because as someone who came from very different surroundings/community/culture than the one I find myself in now as an adult — I’ve often found myself struggling to reconcile these two perspectives. Another funny story: I’d never met anyone, in real life (or at least that I knew of), who’d attended an Ivy-league university before I moved to L.A. Sure, once upon a time, someone may have told me that I could do anything I wanted to, including attending an Ivy-League school, as long as I worked hard enough. The reality though? Attending Harvard or Yale or any similarly-prestigious college was never an actual option for me, even if the intelligence required may have been there. It wasn’t just lack of finances. It was a lack of high-profile connections, lack of encouragement, lack of opportunity necessarily in order to stand out on an application that only accepted the best of the best. And you know what? This is O.K. My life is ok. I am not bitter or disgruntled or feel as though my life is any worse off for not having had the chance to attend the best universities. I talked about this some in my Why Have Kids? post, but unfortunately, life is not fair. We do not all start off on the same footing in life. Some have to work harder and some hardly have to work in order to obtain a certain level off success. This is unfortunate, and something that I alone cannot fix. So I wonder if it might be a better idea if — instead of teaching our children that “they can be whatever they want” — we help them discover what they have, where they are, what they can do, and where they can go from here. This way, instead of encouraging people to have the constant perspective of “I wanted to do this and was told that I could achieve it. But so far I have only failed.“ — we can instead teach people to continually see things from a perspective of “Look how far I’ve come, let’s see how much father I can still go”. I think I much prefer – and am happier – viewing achievements from the latter perspective. As I mentioned above, I’m not saying this is blog post contains answers. I’m just writing out my thoughts. I don’t know if any of these things are far-reaching solutions. I am not a doctor, academic, or researcher. I’m just a mom, a person who thinks too much, and someone who wonders, just as I’m sure we all do, why life is sometimes really, really hard. I don’t pretend to always be happy. I don’t pretend to never get bogged down with depressing emotions. I’m human. We all are. And just as I wrote about in my What is Tully About? post, I’m beginning to think that maybe this is ok.
Maybe it’s ok to not have the answers. To recognize that life is hard. To admit that every day is just putting one step in front of the other. Maybe this is how we all function. Maybe some people are more honest about it and some people are better at hiding it. And maybe some of us are better at viewing situations from a different perspective necessary to continue on. Or maybe, once again, as is a central theme in so many of my blog posts – it all comes down to hope. Hope. The ability to acknowledge the possibility of tomorrow being better than today. Somehow it always seems to come down to hope, doesn’t it? Maybe there’s a needed and soon-to-be-written blog post in me titled “How to Have More Hope.” I’ll think on this one. Maybe coming soon. 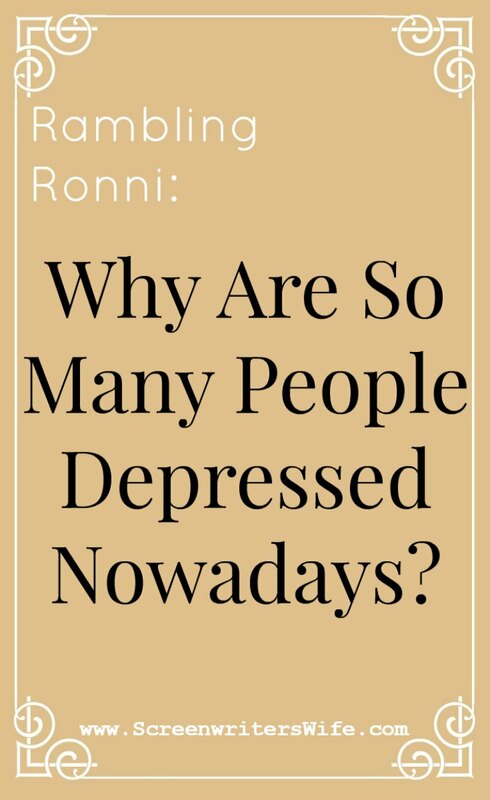 5 Comments on Rambling Ronni: Why Are So Many People Depressed Nowadays? I like Ramblin’ Ronni! Always interesting insights. I saw think all those things that you said or asked were perfectly fine. But then I like to have real conversations with real people, too. Looking forward to more rants, Ronni! Thank you for your post. I will share my experience. My husband’s sister is an animator for DreamWorks. My family visited her and her family in LA for a week last Spring. I was lucky enough to get tickets to the Ellen Show, through a friend of a friend. They were even VIP tickets, so we got to sit in the 3rd row. It was a bucket list item, so I was absolutely thrilled to get to go. I left the show feeling very depressed. I was so close to her, one of my idols, and I didn’t get to meet her, to tell her how much she means to me and how much of an inspiration she is to me. Much of my trip to LA was like that. We drove around Beverly Hills and up into the hills off Mulholland Drive, certainly driving past some big celebrity homes (or at least their front gates), and I felt so depressed to be such a “nobody” in this glamorous city of “everybodies”. I am embarrassed to admit that I am a major fan girl, and I definitely put celebrities up on pedestals, even though I know they are just normal people like you and me. But I just hoped so much to get a glimpse of one of them while I was there, and maybe get an autograph or a selfie with one of them. No such luck. And so, I left LA the same way as I arrived – not a celebrity, and not having met a celebrity. I don’t know what I expected out of my first trip to LA, but I left the city longing for more. I would have been happy just sitting on a bench on Rodeo Drive for hours, just people watching, or even people watching in LAX. I’m just so fascinated by the lifestyle in LA, so different than where I live in Columbus, Ohio. I’m not sure what this has to do with your post, but I just thought I would share my experience with visiting LA. I hope to visit again sometime. Jess – I loved that you wrote all this! And sorry I’m just replying. I hadn’t checked this Rambling Ronni blog in few days and didn’t even realize I’d had any comments over here. And really, thank you for this comment. I feel like it says so much more about Hollywood and this weird world than you maybe knew. I’ve been here for so many years now, and have been lucky, in many ways, to be so much closer to this world of “celebrity” than I ever thought possible earlier in my life. But it hasn’t always been what you might think it is here in this world either. For all the experiences here I’ve been privileged to experience, I can’t say that I feel any less of a “nobody” than you mentioned feeling. I imagine that everyone feels this to some degree – always looking at people who seem to have a better life than them, are cooler than them, or more rich and famous than them. We’re always wondering what it’d be like o have someone else’s life right? Always wanting to make that personal connection to someone who we imagine to be far “above” us? I understand why we have the allure of celebrity status…but also, as you mentioned, why we ultimately come to the realization that the pedestal of “celebrity” we place people on is not what it’s cracked up to be. No matter what, no matter how many followers one may have or don’t have – we’re all still people. We’re all nobodies and we’re all somebodies. Look at celebrity suicides. People ask how could the take their life, they had so many adoring fans! But the persona that fans know are often only a singular perspective of a person. A person who needs to be loved and known for the entirety of themselves too. It is a different world for celebrities – sure, they feed off the adoring love of their fans and they know that they would not be where they are without their fans, and they love their fans…but it also puts them in a place where it’s hard for them to let people in on the inside to see them for who they really are. They have to put up all those walls that separate them from everyone else. They have to keep people at a distance. I don’t have all the answers for this. I probably shouldn’t even be talking about this. I’m realize that I’m much closer to being on the “inside” than most people and even still I still feel so far on the outside of it all. I guess it always goes back to thinking that everyone else has it better than us instead of learning how to be content with what we have, who we are, and what we can do with what we’ve been given. I’m working on that too.